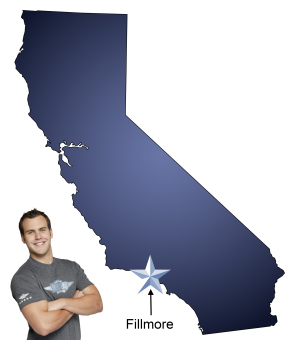 For a trouble-free move to Fillmore, Meathead Movers is the company for you! Our professionally trained student-athlete movers are ready to get you into your new Fillmore home. Although much of southern California is associated with crowded populations and booming metropolises, Fillmore is an exception to the rule. Located in Ventura County, Fillmore is nestled near Los Padres National Forest in the Santa Clara River Valley. This scenic location has helped separate Fillmore from the overwhelming rate of growth throughout the rest of the county, and the city now has a population of about 15,000 residents. If this peaceful town sounds like a pleasant place to call home, you should consider finding the right Fillmore movers to complete the transition. Fillmore was first founded in 1888 thanks largely to the presence of the Southern Pacific Railroad. Today, Fillmore still takes pride in its small-town ambiance. In fact, the town’s motto is “The Last, Best Small Town.” The downtown has a quaint feel, featuring elegant turn of the century architecture. Important buildings include the historic train depot, the movie theater and city hall. This stretch of the town is so well preserved that it is often used in film and television, including the shows “Jericho” and “Big Love.” Most of the population is employed by the agricultural industry and the area relies heavily on its citrus groves. To make the move to Fillmore, there are various Fillmore movers to consider. However, for the best service, Meathead Movers is the obvious choice. Meathead Movers provides high quality moving services for each step of your moving process. Our moving company specializes in local, long-distance, and commercial moves to, from, and within Fillmore. You can start with Meathead Mover’s sister company, Princess Packers, who take time and care when boxing up your possessions. Then, Meathead Movers will load your moving truck with precision and speed. Our services also include transportation and unloading. For additional flexibility, Meathead Movers also provides storage, on-site relocations, and our distinctive moving concierge service, which connects you with local service providers. Best of all, Meathead Movers understands what other Fillmore movers lack. Too many moving companies rely on unprofessional and poorly equipped employees, which make the moving experience slow and unreliable. Meathead Movers, therefore, recruits reliable student-athletes to ensure the best service possible. Our Meathead employees are clean-cut and drug-free and are even expected to jog when not carrying anything while on the job—saving you time and money! These distinctions set Meathead Movers apart from other Fillmore movers. For more information on how Meathead Movers can handle your next move, please contact us today for a free, no-obligation quote for you upcoming move. Moving to Fillmore? Here are some helpful resources. The young men were great. Polite, hardworking, and friendly. I can't say enough good things about the moving experience. My two guys were very pleasant but not quite as careful with my things as I expected them to be. I knew the sofa sleeper would be the number one challenge and it was. Sustained a rip in the upholstery on an arm. I was compensated for this but only slightly more than what I paid for the insurance. I don't think it can be repaired to my satisfaction. Other than that and some "near misses" things went well. MeatHead Movers are great. We already have referred someone to you. Thanks for the great service!! Always on time. Always very polite. The movers were awesome, friendly and very professional! Great attitude from everyone. Helpful with things outside the scope of moving and packing... such as referrals for shredding of documents. The ongoing follow up process is how every business should operate. My mother-in-law told me that the packers were delightful and very respectful. They did everything she asked of them. I will absolutely recommend your company if the movers tomorrow are anything like the packers today. Efficient, polite, cute movers. They moved fast and wrapped up anything that might get damaged.